2 by 3 Heroes: PEW PEW PEW!!! Getting back to the laying the praise on people, I was one of the many that got a Zippy Zappy'ing for Christmas. If you haven't read his blog, Torren' Up Cards (at least that's the current name - it changes a lot), give him a look. Along with the prospect hunting, Zippy gets his hands on a lot of Japanese cards. He just came back from a little vacation with a crapton of Sega Card Gen cards. But before he left, he sent me a nice little package. 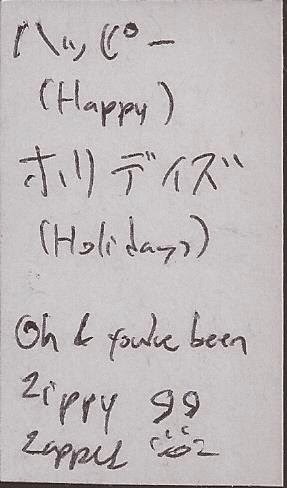 His handwriting is atrocious, though. Half those words don't look like English. Great bunch of White Sox in the package. MIIIIIIIIIIIIINNNNNNNNNNNNNNNNNNIIIIIIIIIISSSSSSSSSS!!!!!! I pulled two of those Sale mini Bowman Chromes, only both of them had a picture of Kershaw, so I dumped them on a couple Dodger bloggers. Nice that I got that Sale from Zippy. You should follow the exploits of Captain Rex and the hunt for Padawan Torren on his blog. 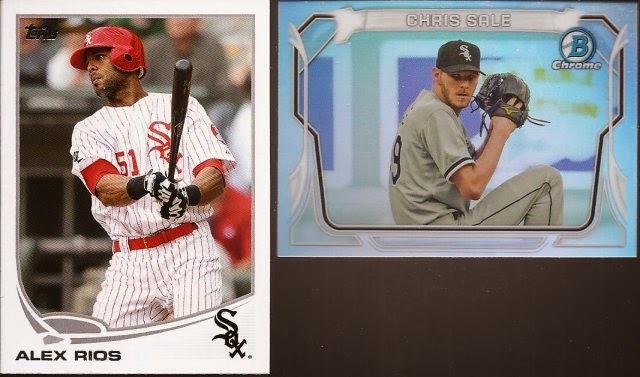 While the Morel certainly isn't a prospect anymore, that Anderson and Hawkins make for nice additions in my Sox box. ROY cards? Yes please. I had pulled that fire Bowman card at my LCS a couple months back. The unfortunate part is I pulled it in a pack when we were playing traditional pack wars, and I lost the round. So now I am happy again as I have one. The Chrome on the right is a dupe, but only cuz I needed one in my throwback binder. So really, it's not. Talk about your old prospects!!!! Some great vintage in his envelope. I never noticed that in some years of printing, Topps puts dividing lines between the cards, as seen on that Grzenda miscut. The final, top two cards he sent, though, are these two beauties. 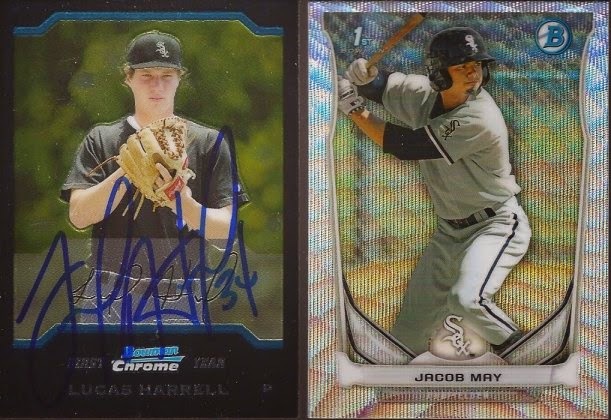 I'm a sucker for autographs, so a nice addition to my binder with the Harrell. That May on the right? Oh, it's just serialed 12/25. I have no idea the refractor name of it - I think I'll just call it "mine". Thanks again Zippy. If any of you noticed another time I posted cards from ZZ, I totally screwed up and posted a K Pop video instead of a J Pop video. I got it right this time (I hope), but I have one question: are all girl (and boy) bands made up of 48 members? It's crazy all the performers in each group. PS - I lasted about 90 seconds watching/listening to that. Click here if you need a palate cleanse. Glad you liked the cards. I've already started assembling another package for you and it should be shipped out soon enough. And yep that's a J-Pop group this time. One of Tanaka's favorites at that. Although not all idol groups in Japan are made up of dozens of girls/boys though. Most of them are just made up of 4-5 people. Wow great package. Love the Jose's! Every year one of my buddies and I hold a baseball prediction contest picking MVPs, ROY and World Series winners. The year Brent Morel was a rookie my buddy was all in on him. He thought he was going to be the next Mike Schmidt. Obvioulsy that didn't turn out. The joke was extra special when the Pirates signed him as a minor league free agent last year. Needless to say he was terrible and I made fun of my friend a lot. A Christmas Card! Nice score. They're called Silver Wave refractors, btw.